SPRINGFIELD TWP. – University of Cincinnati head football coach Luke Fickell continues his local carpet-bombing recruiting tactics, nabbing St. Xavier 2018 standout Blake Bacevich. Bacevich verbally committed to the Bearcats Saturday on his Twitter account, and St. Xavier coach Steve Specht confirmed in a text message. Fickell and his staff have been aggressive in targeting local prospects. On National Signing Day Feb. 1, the Bearcats received letters of intent from Colerain LB Kyle Bolden and La Salle’s Jarell White. Bacevich was one of the local names in the 2018 class that’s been turning heads lately. Bacevich, listed 6-foot-4, 215 pounds, had offers from Toledo, Yale, Ball State, Bowling Green, Brown, Central Michigan, Eastern Kentucky, Eastern Michigan, Kent State, Miami, Ohio, Pittsburgh and Western Michigan, according to Cincinnati.com’s John Snodgrass. 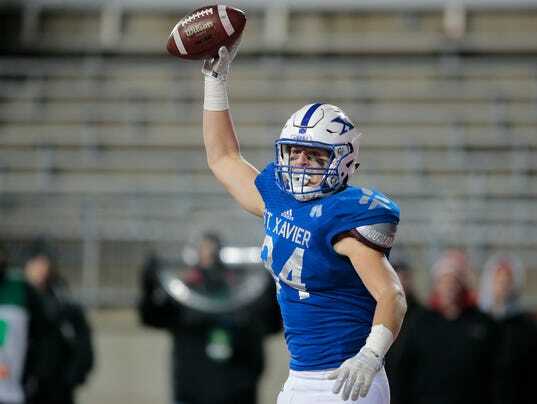 Bacevich was crucial to St. Xavier’s 2016 state championship run, finishing his junior season with 56 tackles, 5.5 sacks, and five fumble recoveries, the last of which he returned for a touchdown in the fourth quarter of the Bombers’ 27-20 state final win over Cleveland St. Ignatius. Bacevich was Greater Catholic League South second team this past season. The Bearcats will hold spring football practice at Elder on April 1.